New levels of reliability and performance. Control your costs. Moving your Exchange environment into the Cloud means you get all the advantages of on-site collaboration, whilst reducing the IT overhead of running on-site Exchange or Small Business Server. Get more for less. It may cost less to move to Hosted Exchange, but by no means do you sacrifice service quality. 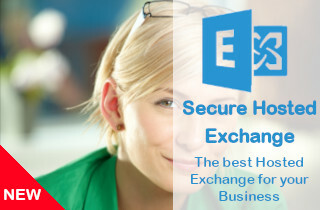 The Hosted Exchange environment is super-resilient, is fully managed, and every email is scanned for viruses and spam before it arrives in your inbox. Backed-up data. Industry leading cloud-based security and segmentation ensures your data is safe and secure. Data is also backed-up each day on a 30-day retention period. Award winning anti-spam and antivirus. All inbound email is first passed through an award-winning Email Security system, providing you with outstanding protection of your mailboxes - as standard. Dual hosted. All Hosted Exchange services are dual-hosted. Multilayered systems are located across geographically distributed locations so, in the event of an outage, traffic is switched to a redundant data-centre and services are resumed. Exceptional Support. We understand how important it is to provide you with support when you need it. You get the back-up of our highly-skilled support team who will help, advise and guide you through the installation and running of your Hosted Exchange services.